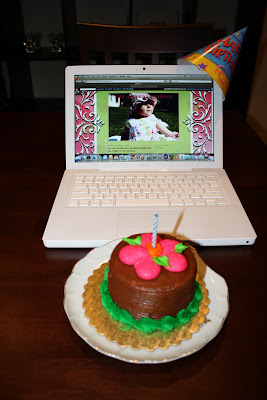 Today is the 1st birthday of The Amanda Diaries! It was one year ago today that I wrote my first (two) blog posts and this sweet little adventure began. Over the course of the last year, I have written 118 posts and read 462 comments. Of course, little Miss Olivia has been the (main) topic of 67 posts (43 of those since her birth) with my lovely husband and family not far behind. That's not surprising since keeping everyone informed about our little family is my biggest reason behind doing this. I'm so excited to have chronicled my pregnancy and the beginning of Olivia's life on this blog and am looking forward to turning it into a memory book for her. That being said, I DO totally love hearing from YOU, Dear Readers, so please comment away. I spent last night and this morning tallying up my biggest fans and realized that there are many of you who have commented before but have stopped doing so. Please, please, please don't be afraid to tell me your thoughts. I LOVE seeing your reaction to what's going on in our little world. Anyway, I'm sure you are all just dying to know who my NUMBER ONE fan is......drumroll please....with a staggering 89 comments, the award for most comments goes to.....Miss Lauren Robinson! Marissa, you come in a close second with 75, and Mom and Irma tie for third with 71! Honorable Mention goes to "Caroline" as she is our youngest commenter! Big love to you all. I thank you for checking back here and inviting me, David, Olivia and Magnum into your home approximately every 3 days. (Yep, I'm a math geek.) I hope this little blog keeps on going for many years to come. And, speaking of birthdays, Magnum just celebrated his 9th birthday on Sunday. Happy Birthday, Baby Boy! **I can't think Lauren and Jill enough for encouraging me to start this. Wish I could share a piece of chocolate cake with you to say thanks! ***Update: Yes, Lauren, there is a card for that! I've enjoyed reading your blogs and hope you keep it up. It's a wonderful medium to keep up with the lives and thoughts of friends. So... what kind of card is there for this award? "Um, Thanks for Stalking Me"? "You Obviously Have Too Much Time on Your Hands"? "You're Such a Big Mouth You Just HAVE to Respond to EVERYTHING!" ??? Which one shall I choose!?! 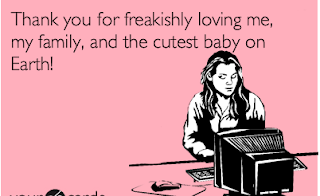 What about "Thank you for freakishly loving me, my family, and the cutest baby on Earth"? I'll take that. I love checking in on our family through this medium since the road is long the the Internet brings us all closer so quickly. Keep up the lovely blogging...and give Olivia a big hug and kiss from us. Didn't know you were keeping count or I would have tried harder to post something!!!! Just joking, I agree with Irma (as I often do), this is such an awesome way to keep up with my precious family in CA. Thanks so much for starting it and I wish you and the blog many more posts to come.